TheION v6 XL is a FDM 3D Printer inspired by the Prusa i3, one of the most popular Reprap projects among the open source community. The ION version has been designed entirely by the ThingiBOX team and has undergone a process of continous improvement since 2012. This kit includes all the necessary componentsfor the construction including screws, electronics, cables, connectors, heatshrink tubes, kapton tape, cable binders, USB cable, etc. (tools are not included, basic tools are necessary). The frame, the base and almost all the components are developed and manufactured by ourselves in white and transparentmethacrylate, 8mm and 5mm thick respectively, making the design elegant, yet extremely precise and robust. This kit does NOT include any filament. If the Prusa i3 ION kit is shown as “out of stock” you can still purchase it. Please contact us through our customer service form . The printer is prepared for printing with 1.75mm filament. If you wish to use 3mm filament, please leave us a note using the "Comments"-field during the purchasing process. Unlike the original Prusa i3, our version has an opening for the electronics and the printer’s power supply. Thanks to the housing the electronic components such as control boards, power supply, cables and connectors are stowed in an orderly and safe manner. Two small axial fans ensure the cooling of the electronics. The power supply features a built-in temperature control that cuts off electrical power in case of overheating. The maximum printing volume is 300x200x190mm. The objects are printed on a BuildTak surface which offers high rigidity and durability . Beneath the BuildTak we place a 3mm thick carbon steel board and a silicone base adhered to it that provides extra rigidity and at the same time allows to print filaments that present adhesion problems when printing at low temperature, such as ABS. Depending on humidity conditions and room temperature, the heated bed can reach a temperature of 130ºC. The extruder is an E3D v5 full metal hotend that allows to print at temperatures as high as 300ºC. It is compatible with almost all available filaments. The nozzle has a 0.4mm diameter, this is a compromise between printing precision and speed. An additional fan prevents the filament from melting before time and thus clogging the duct. The extruder incorporates standard components and can be completely disassembled; this makes cleaning and spare part replacements easier. The Prusa i3 ION uses a MK8 drive gear wheel to feed the filament into the extruder. The wheel is fixed on an axis with a gear on one end which increases by factor five the power that is transmitted by the motor. This way we can use a smaller motor in the extruder, reducing the motor’s inertia and increasing printing quality at the same time. This applies specially where the extruder suddenly changes its speed, for instance when printing corners. 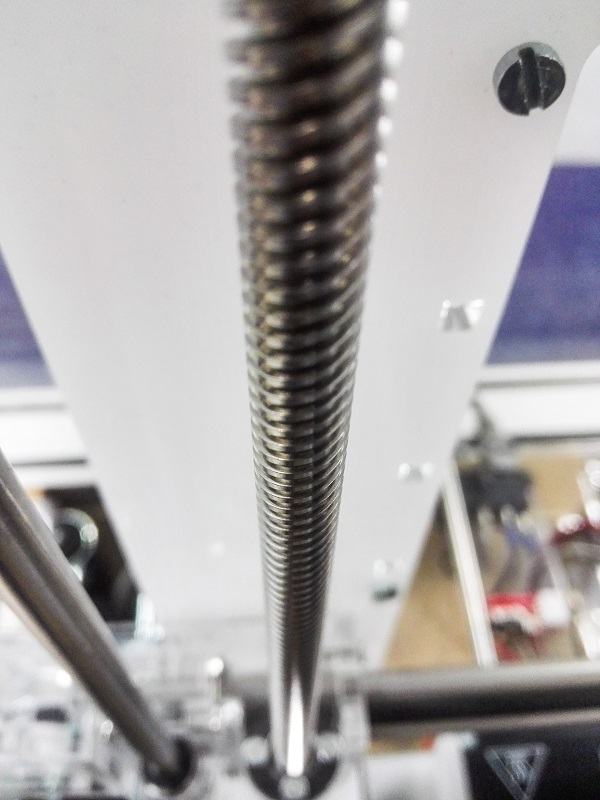 For the Z axis we use Tr8x8 threaded bars because they improve considerably the printing results. With the Tr8x8 bars we employ machined POM nuts that completely eliminate the backslash, typical in traditional threaded bar configurations. For an even higher precision, our POM nuts are 10mm longer than the usual nuts. For the movement of the other axis the printer uses GT2 synchronous pulleys and belts with manual tensors. As for the electronics, this printer includes an Arduino MEGA 2560 controller together with a RAMPS 1.4 shield that incorporates 4 A4988 drivers which move 5 NEMA17 stepper motors. Also included are 3 endstop switches with cable for automatic homing. Although the printer consumes about 200W when the heated bed is running, the included power source can provide up to 360W (30 amp DC at 12V) and features a security system that cuts power off in case of a short circuit. The external wires of the printer are hold in a cable chain. This way the cables are kept orderly and safe while the axis are moving. Two connectors are situated on the back side, one for the AC power supply through a socket with switch and one for USB connections in case you wish to control the printer directly from your PC. The housing features also an opening and bores for a Raspberry Pi 2 (not included) which allows to connect the printer to the internet and control it via Octoprint. A LCD 2004 screen monitors the printer. The screen controller includes a SD card that allows to load designs without the need for a PC.